Does winter get you down? Do you dream of escaping to somewhere, anywhere that has better weather than where you are now? Do you dream of a snowy winter wonderland with the bluest of skies, the purest of snows and the freshest of fresh air? Do you ski? No? Oh, sorry, you’re just going to have to stay put then, I’m afraid! At least, if you’re a non-skier, this is what the media would have you believe. The ski industry is big and worth around £3bn in the UK. At this time of year you can’t avoid the in-yer-face adverts and social media posts advertising ski gear, ski holidays and ski experiences. So does winter for the non-skier exist? We’ll answer this question. But first, what are you reasons for being a non-skier? Maybe, like me, you tried resort skiing but simply never clicked with hurling yourself down an icy, snowy slope with 2 planks strapped to your feet. Maybe, like me, you made a fool of yourself one too many times falling off the chairlift or, worse still, ending up flat on your face trying to master the button lift! In my case the phrase ‘all the gear but no idea’ applies! 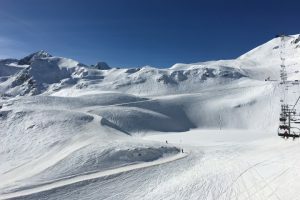 Despite having the Pyrenees mountains as my playground and some un-crowded, great value, family friendly ski resorts on the doorstep, I have never really enjoyed skiing. I am always too afraid of injuring myself to be able to relax on the slopes and of course the more you tense up the more likely you are to have an accident. My skis and boots are gathering dust in the attic as I write. What a waste. 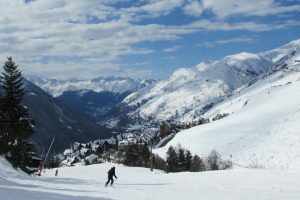 Finances, or a lack of them, are a major consideration if you’re considering taking up skiing and going on a ski holiday. 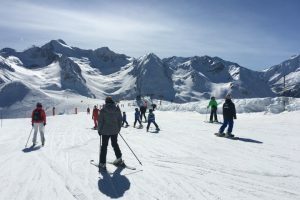 It can cost a small fortune to kit the family out in salopettes, ski jackets, hats, gloves and miscellaneous other bits and bobs that you simply must have if you are not to look out of place on the slopes. Then there’s the whole cost of hiring ski equipment in resort and buying ski passes and maybe booking the kids in for some ski lessons. And let’s not forget that you have to get to the ski resort, pay for accommodation and foot the bill for a week’s living costs. A family ski holiday can set you back thousands of pounds, especially if you choose the Alps. No surprise then that the sport has always had a certain glamorous caché and is seen as the preserve of the more affluent sections of society. Skiing is quite simply outside of many people’s budget. But don’t despair. There are options for the non-skier to enjoy a fabulous fun-filled and action-packed winter holiday in a spectacular snowy winter wonderland. Hurrah! The even better news is that a winter holiday for the non-skier won’t break the bank. Here’s our pick of fun-filled activities for a non-skiing holiday. As a non-skier myself, snowshoeing is my number one choice of winter activity. You don’t need to invest in expensive gear or clothing and it’s probably the most environmentally friendly winter sport there is. 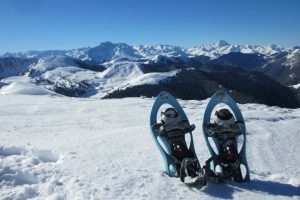 In the Pyrenees there are numerous itineraries for all abilities. Need a good workout? No problem. A thick layer of fresh snow has fallen and you’ll be blazing the trail in knee deep snow. Your route takes you up that hillside onto the ridgeline where you’ll be rewarded with panoramic views of the high mountains that border Spain. Fancy something for the younger members of the family? There are miles of beautiful forest and woodland tracks to explore with no great physical or technical difficulty. 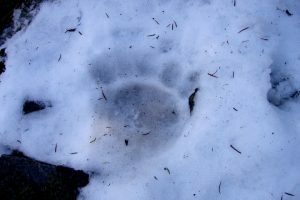 Keep an eye out for animal tracks including those of deer, hares and rabbits, foxes and maybe, just maybe the brown bear! If you’ve never been snowshoeing before, here’s a post we wrote earlier about what you can expect. Airboarding is quite simply the most fun you can have at a ski resort that doesn’t involve skiing. At the end of the day once the lifts have closed to skiers, your instructor takes you up to the top of the piste where you’ll be introduced to your airboard. After a briefing on the techniques you need to master it, you’ll lie face down on this kevlar-coated inflatable cushion and let loose down the slope, using your bodyweight and feet to steer. It’s a fantastic adrenalin-fuelled activity for competitive siblings and mates on holiday together. Cathy and Frank from adventure travel blog Roar Loud think it will become your next winter obsession. Try it and see for yourself! 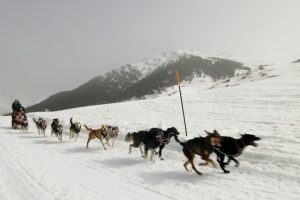 There’s something so captivating, so enchanting about riding on a sled pulled by a team of huskies. 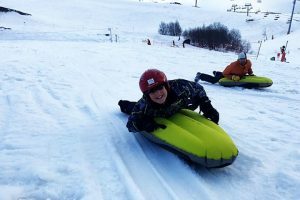 No surprise then that this is probably the most popular winter activity with the families that we welcome to the Pyrenees. In our experience the huskies clearly love their work and they really are well looked after. There are numerous other sports and activities that you can enjoy on a winter holiday for non-skiers. 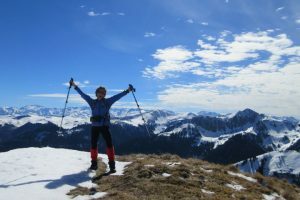 For the greatest flexibility and the biggest choice, choose a winter multi activity holiday which allows you to pick and mix the activities that you wish to do on your vacation in the Pyrenees. So, ignore all the hype that surrounds skiing. There is a whole world of winter fun out there for the non-skier. You just need a gentle nudge in the right direction to discover the endless possibilities. When are you coming to play?